Note: Use of these forms by your institution is completely optional! This form is designed to mirror the information that candidates will be required to input into their applicant profile in the "Self-reported Education" portion of their online TEACH teacher certification application. By providing candidates with accurate, program-specific information before they attempt to create their TEACH account and apply for certification online, institutions will help ensure that the application process goes more smoothly. When coupled with the timely submission of institutional recommendations for certification, candidates should enjoy the full benefits of the online teacher certification application process, including expeditious processing and faster issuance of teacher certificates! This form was designed to be used by institution officials to provide approved teacher education program completers who wish to apply for teacher certification with accurate and timely certificate and program-specific information to expedite the application process. Institutions simply reproduce the form and distribute them to candidates with institution and program-specific information that they need to complete the "Self-reported Education" portion of their online TEACH applications. The forms - with completed program-specific information - can then be distributed to candidates as a handout for use when they complete their online TEACH application. Both files are in MS Word format (Office 2003) and can be customized by your institution to include your institution name at the top of the form and, at the bottom, institution-specific local help contact information. By providing a local help contact, for example, either the Department Chair or the institution’s certification officer, you’re providing another service to help your students complete their teacher certification application with a minimum of difficulty. Once un-protected, customize the form and then "protect" the form by clicking the padlock icon again. 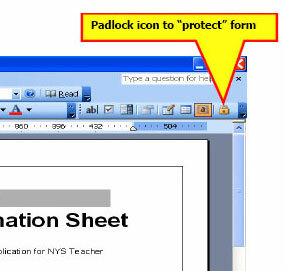 You’ll know the form is "protected" if all the other icons in the MS Word formatting toolbar are "grayed out." Protecting the form is important; otherwise, individuals you distribute the form to could inadvertently edit the contents of the form while trying to use it. This becomes even more important if your institution has several education programs leading to teacher certification and you choose to distribute a "generic" Student Application Information Sheet file to say, different Department Chairs or faculty, to complete the institution-specific portion of the form prior to posting to your institution's web, emailing or printing and distributing hard copies to your candidates. Be sure to save the new, customized form file(s) and, perhaps rename it so you’ll be able to identify this as your institution’s "generic" TEACH- Student Application Information Sheet. Once customized, save the file in an MS Word format or use an application such as Adobe Acrobat to convert the file to portable document format [.pdf] to ensure consistent appearance, to post on your institution web or intranet, or for desktop publishing higher quality print versions. We hope that you find these forms helpful in your efforts to assist your candidates with the TEACH online teacher certification application process.